For some reason, we have received several questions lately on the various metals generally used in bus construction. This was probably expected since some of these metals have been in the news recently. Prevost has introduced aluminum luggage bay doors on their X-series coaches. Caio is putting aluminum siding on its new coaches and Setra is dipping their frames into a tank to coat them against corrosion. I can go through some of the basic items on different metals without getting too involved with metallurgy. None of this is rocket science. In fact, I would bet that many of our tenured readers are already knowledgeable in this area. While we can provide some basic information, hard and fast rules are difficult because of differences in both bus construction and usage. Let me start out by saying that there is no “best” bus for everyone and every application. One operator may want a local shuttle bus to operate three hours a day, transport 20 people around town, and have a useful life of 200,000 miles. Another operator will ask for a bus that will carry up to 50 people in long distance scheduled service and will last for 2,000,000 miles. Somewhat obviously, the “best” bus for each of these applications is not the same bus. Next, let me suggest that a great deal depends on quality of construction and related longevity. Stainless steel and aluminum do not necessarily improve the quality of construction. However, they can help the bus last longer and improve resale value by reducing corrosion as the bus gets older. A third point I feel compelled to bring up is galvanic corrosion. Using different metals in the same bus can cause problems where they join. I remember hearing more on this years ago. It appears that in recent times this concern is more under control. A good place to start is to review some of the basic differences between the European and American bus markets and typical construction. European coaches typically are expected to run fewer miles than on this side of the Atlantic. Bear in mind that it is less than 1,000 air miles from London to Rome so you do not put a lot of miles on a coach unless you run a tour beyond typical Western Continental Europe. Moreover, since tours are a major part of European coach operations, there is more pressure for newer coaches. Hence, it is not unusual for a European coach to be built from mild or carbon steel and have a useful life of about 1,000,000 miles. Since there are no major long distance scheduled service operations in Western Continental Europe and most of the tours are short by American standards, there is no strong demand for coaches with high longevity. However, to be fair, I should mention that any of the European-built coaches that survive on the American market tend to be at least a cut above the standard European coach. In some cases, the export model going to America may have more features than coaches built for local use. While coaches in Western Europe have primarily evolved around tourism, the bus industry in America started out primarily as scheduled service. Greyhound started out running between Hibbing and Alice, Minnesota and virtually all of the earlier larger bus companies were heavily involved with scheduled service. Add to this the fact that the distance from New York to San Francisco is three times the distance from London to Rome. Hence, early bus design in the United States and Canada centered around longevity and durability. For the most part, I have no problem with suggesting that our domestic coaches (now primarily built in Canada) are easily the most durable in the world. They not only have a high stainless steel content but typically have a useful life of 2,000,000 miles or more. When does it pay to use aluminum or stainless steel in addition to or instead of mild or carbon steel? This is a fairly typical question but, again, a great deal depends on the operator’s needs and the type of operation. The more years you plan to keep the bus, the more that stainless steel or aluminum would be a positive factor. Buses that are built to operate more than 1,000,000 miles are also good candidates for these metals. In addition, stainless steel or aluminum could be more important if residual value is a high priority to you. Carbon or mild steel is the usual metal used in most buses that do not have a high longevity. The industry tends to define it as having no more than two percent carbon and no other appreciable alloying element. It is the most popular type of steel, is less expensive than other specialized types of steel and is generally easy to work with. Its biggest negative feature from our standpoint is corrosion. Iron in the steel mixes with oxygen in the air to form ferric oxide, forms of which are more commonly known as iron oxide or rust. In earlier decades, many of the buses built in the United States used carbon or mild steel. It worked well for some makes and models and not so well with others. For example, Eagles were notorious for rust. There were people who unkindly suggested that if you stood close to an Eagle you could actually hear it rust. After looking at going to stainless steel, Eagle converted to CorTen (or “weathering”) steel. This tended to reduce the rust problem but is not as good as stainless steel in this area. Carbon steel is almost always used for cutaways and other body-on-chassis buses in the United States and Canada. Since body-on-chassis buses rarely run for more than 500,000 miles, the use of stainless steel would be considered a waste of money by most people. However, I have seen cutaways that use some stainless steel in areas most prone to corrosion, such as doors and stepwells. Temsa’s coaches coming to America have high stainless steel content. However, I have been told that Temsa will build some models using mild or carbon steel on customer request. This does reduce the price of the coach but it is more prone to corrosion. Setras are built with carbon steel but since their acquisition by Daimler, the frames are very carefully rust proofed in a cathodic dip tank at the Mercedes facility in Mannheim, Germany. Holes in the tubular steel allow the treatment to go both inside and outside of the frame members. The use of an electrical charge on the frame makes this process similar to plating and provides a very thorough coating. 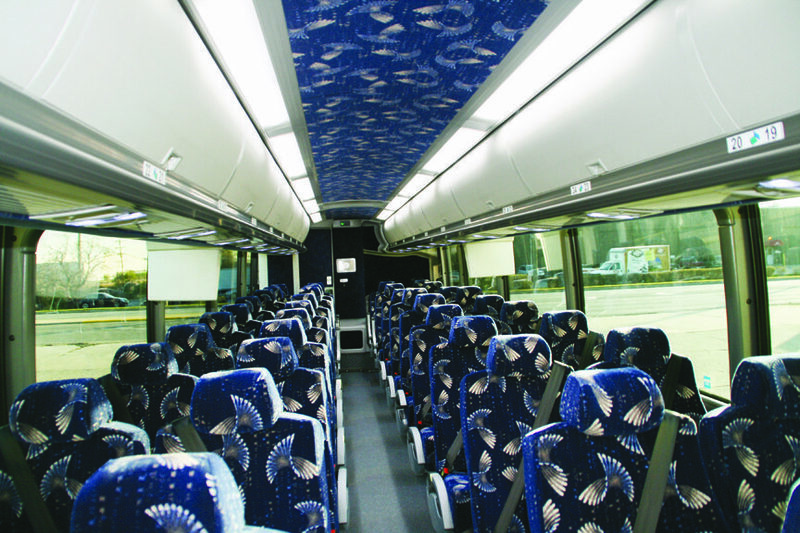 Aluminum has been used in bus and coach production for a long time. There are different kinds of aluminum alloys with some less likely to suffer corrosion and some actually stronger than some steel alloys. The primary advantage of aluminum is its ability to withstand corrosion. Aluminum does react with oxygen in the air to produce Aluminum Oxide. This then typically coats the aluminum and tends to prevent any further corrosion. A second advantage of aluminum is low weight. This can be increasingly important today when weight and ecology are important considerations. However, there are at least two disadvantages when using aluminum. One is the potential for galvanic corrosion when in contact with steel. The second is that most aluminum is not as strong as steel and hence is less appropriate for use as structural members that have to bear a lot of weight. General Motors made good use of aluminum on many of their buses and coaches. The use of aluminum for siding was typical. What the industry called “silversiding” was actually aluminum. I note that many of the Scenicruisers ran more than three million miles before leaving the Greyhound fleet, suggesting that GM knew how to make steel and aluminum work well together. 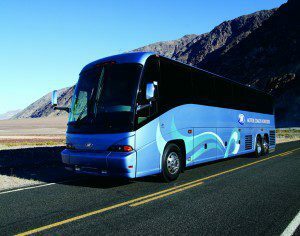 Today we are seeing a reemergence of aluminum in buses and coaches. Its light weight and reduced corrosion are factors making it popular. I note that Prevost is now offering aluminum baggage bay doors on its X series coaches. In addition, I find it interesting that CAIO is putting aluminum siding on its coaches. I suspect that we will see more aluminum on coaches in the years ahead. Of course, the “top of the line” as far as buses and coaches go is stainless steel. Also known as inox steel (from the French inoxydable), stainless steel is usually defined as a steel alloy with a minimum of 10.5 to 11 percent chromium content by mass. The single biggest advantage of stainless steel is its reduced corrosion. Unprotected carbon steel tends to form iron oxide or rust when exposed to air and moisture. The rust is active and helps form more iron oxide. Since the iron oxide molecules are larger than iron molecules, the rust tends to flake and fall off. Hence, over time the carbon steel is reduced in size and in strength. Stainless steel is stain-less, not stain-proof. The chromium in stainless steel mixes with oxygen in the air and forms a coating of chromium oxide that protects the metal from further corrosion. On the negative side, stainless steel is more expensive than carbon or mild steel. In addition, some people say that some types of stainless steel can be more brittle than mild steel and hence more difficult to work with. Credit for introducing stainless steel into American coaches in a big way goes to Harry Zoltok, the founder of MCI. Challenged with building buses for Canadian Greyhound that could survive Canadian winters and pre-War Canadian roads, Zoltok developed a combination of platform integral construction and stainless steel that undoubtedly qualifies as the most durable type of bus ever built in any quantity. This goes a long way towards explaining why MCI has had an enviable reputation for durability and continues to enjoy a substantial market share. However, I do give credit to other manufacturers for learning that stainless steel enhances the longevity of an already high-quality coach. Today, Prevost, Van Hool and Temsa coaches sold in the United States all have a high degree of stainless steel content. I should at least briefly mention that we are seeing more and more plastics and similar materials being used in bus and coach construction. Bob Lee and his crew at Neoplan once developed a lightweight carbon fiber bus. Today’s modern buses typically use various types of plastics or fiberglass for front and rear caps, walls and sidings and even flooring. Their main advantage is light weight and a lack of corrosion. Although in most cases, these materials are not strong enough to be used for structural members. Finally, for those people who have asked, the most durable American buses in the past were built with platform integral construction. This includes the popular GM coaches as well as the MCI coaches through the D model. The newer models built with tubular web frame construction have not yet met the three-million mile record of the Scenicruisers. However, it can easily be suggested that in todays operations, heavy in charters and tours rather than heavy scheduled service, coaches simply do not run as many miles as they used to. Whether or not the top mileage makes any difference, tubular web frame integral construction appears to be replacing platform integral construction. The major reason for this is that platform integral construction tends to limit design possibilities in an era when design is increasingly important in a charter and tour market. In spite of this, I suggest that stainless steel will remain important in coach construction for a long time and we most likely will see more aluminum in the years ahead. Posted on May 4, 2016 Leave a comment on NEBA ANNUAL MEETING June 23-26, 2016 – See you there! Posted on February 18, 2016 Leave a comment on We’ll see you at the DATTCO Expo!